Ever since Facebook released earnings last quarter this has been one of the leaders driving this market rally. So it makes sense to target this stock on any meaningful pullback. 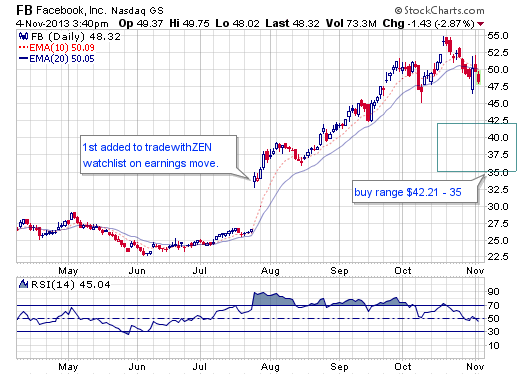 I added it to my premium watchlist tradewithZEN on 7.25 when it closed at $34.40. Some would say after rallying 15 plus percent that this was due for a pullback, and those that said would have been wrong. Often times the strongest stocks never look back. I traded in and out of this for a tiny gain and missed nearly all of this move, however it did provide some buying opportunities along the way but due to an iffy market and the Gov’t shutdown and Debt Ceiling I chose to sit out of some of late Sept. However I believe this could be setting up over the next few weeks for another good buying opportunity if it pulls back to the levels I annotated below. I think this recent earnings report was slightly priced in and that’s why it’s pulled back (or at least hasn’t screamed higher) and it still needs time to digest the massive gains it’s had last quarter. I think it’ll pull back between $42 and 35. Now that is a wide range so the absolute safest way is to scale in three times at 42, 38, and 35 if you don’t have specific methods for entering momentum stocks. That way you don’t over-think the trade and get a position started while cost averaging should it go down. I generally scale in only twice, but that is a preference. While it’s tough to say exactly when I’ll start buying because I like to see how it pulls back, but I suspect it’ll be somewhere around $40 and maybe avg down if it does get near $35. I also consider market conditions and how leveraged I am when making a trade so it’s nearly impossible for me to say where I”m going to buy a stock 2-3 weeks from now, but that’s somewhere near. Of course if it never makes it down that far at all and screams higher then I’m OK to let it go because I feel the reward/risk just isn’t there buying anytime above $42. That also happens when trading. I live tweet all my trades on tradewithZEN, so if you are looking for a service with transparency where you can learn how to enter momentum stocks with a few different entry points, you may want to consider for$25/month. I’m also on Ditto Trade if you want to automatically mirror my account without doing a thing.